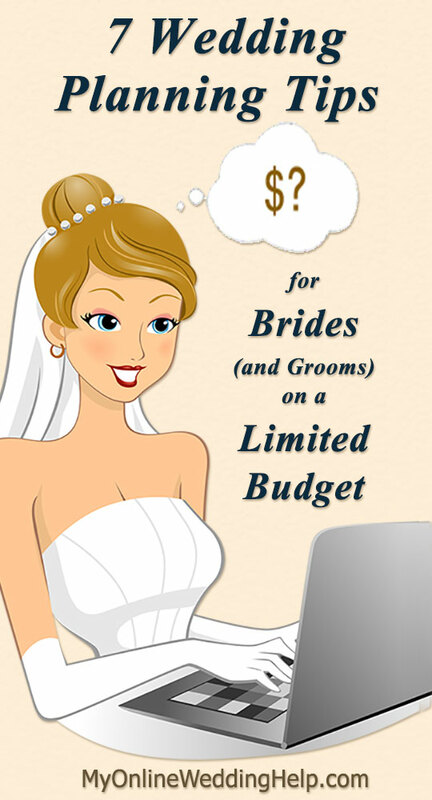 One of the first realities when planning a wedding on a budget is discovering IT’S EXPENSIVE! But can a bride- or groom-to-be still have the wedding of their dreams? Absolutely. The secrets to budget wedding planning are two-fold. Rank what’s important to you and be conscientious about what you spend. Here are seven ways you can do this. When dreaming of the perfect wedding, there are likely two or three elements you imagine. What are they? The gown? Decor? Location? The people? Whatever the aspects, these are where you should put your priorities. First, take a minute and decide what, exactly, are the pieces of the wedding day of most important to you. Now, decide to make these your planning focus. With this mindset from the start, you will be able to concentrate on the few elements that make the dream a dream. You will soon forget the other parts that don’t happen as you at first anticipated. Most of us have heard the phrase “penny wise and pound foolish.” It is a description for someone who watches every little cent. Yet is wasteful when it comes to larger expense decisions. You can be wise on both fronts! Saving dollars on several smaller expenditures adds up. As does making wise decisions on larger costs. (b) projects you do not have the time or available talent to do yourself. Cut costs in areas that are outside the top priority list you made above, in #1. Also, save where you can DIY. Remember to factor in the time and stress factors when choosing what to do yourself. Before making final decisions do a reality check on what quality you will give up. Your cousin’s videography skills or Uncle Walt’s speakers may be a bit too sub-par compared to the pros. Expertise and experience do matter, so scrimp here with your eyes wide open. 3. Choose a Nonconventional Venue. As nontraditional weddings have become more popular so have unconventional spaces. Couples are having receptions in spaces like empty buildings, barns, or the outdoors. Be aware of hidden costs. Remote locations may be missing electricity, bathrooms, or food preparation areas. Providing for these missing amenities can eat into your savings. Also, think about avoiding the cost and logistics involved with two venues. Consider using the space for both the ceremony and wedding reception. For ideas, see 76 Unexpected Wedding Reception Venues. I know, you’ve heard that before! There is a good reason. Guest count determines many wedding reception costs. Square footage, table rentals, number of decorations, amount of food and drink, to name a few. There are two approaches to saving here. (a) Fewer people or (b) cheaper food. (a) Invite an intimate group of family and friends. You can spend more per person on food, favors, and ambiance. (b) Invite everyone you, your partner, and all your parents want at the wedding. The party will be a larger event. But it also means you will have to choose less spendy options to stay within budget. Serve a generally lower cost buffet, for example, or have only the entrees catered. Another idea is to ask each person in your family cook their specialty for your wedding. Some choose to skip a sit-down meal and serve drinks and hors-d’oeuvres only. I even read of one wedding that had an all-dessert reception. Whatever your approach, be sure to note it on the invitation so your guests can plan their meals for the day. For more ideas on keeping the food situation under control, read 23 Ways to Save on Wedding Food Costs. There are so many modern options. The days of relying on a bridal store for your products are long gone. Make some items yourself and buy supplies wherever it makes sense. Create your own easy centerpieces or veil, for example. Or give handcrafted, personalized gifts to the wedding party. If you like the idea of making your own veil, watch and read my five-part Make a Veil tutorial. It’s easier than you may think. 7. Harness the power of the Internet to keep costs down. When I first wrote this post e-commerce was a new thing. So “shop online” was a more earth-shattering tip. Now, buying online is pretty much a given. Amazon and Etsy are two go-to sites to look for supplies and gifts. Not to mention the dozens (hundreds?) of wedding dress sites. And almost every retailer has a corresponding website to buy their products. The part that some people miss is the advantage of digital savings methods. There are ways to automatically get more savings or rebates by using the right methods. Read Five Wedding Shopping Savings Tips for more details on saving through online shopping. Pay for you honeymoon first! To many people wait untill they just don’t have it in the budget then opt out, which is sad because it’s so important to have that extended private time together. Possibly reuse someone’s wedding dress! I know every bride wants her own PERFECT dress but not with todays pricing. My mother is letting me use her wedding dress and making any alterations that I want. I’m sure you can get a good cheaper dress online at ebay or some other website. Making alterations to make it the dress of your dreams is still cheaper than a $3,000 dress. Great tip, Kara. Thanks for the comment! Have an afternoon reception. You will save 30-50 per person by feeding them lunch instead. Thanks for adding to the ideas, Lindsey! Consider having a family potluck or carry-in. Assign different food groups to the different sides of the family. Any of the bride’s family can bring Entrees, groom’s family bring desserts, and friends bring finger foods. Put the assignments on your invitations. Families are more than willing to help and it is infinitely cheaper than a caterer. It isn’t as fancy but you definitely have more food! If you’re religious, your church/synagogue/mosque/whathaveyou should let you have your wedding there for free, maybe asking for a donation to cover utility costs, and you can use the lawn or fellowship hall for the reception. Saves time and money. Also, instead of favors, have a dessert buffet and have little baggies for people to take home a few treats – they get fed at the wedding and a favor, but you only shell out for one thing. Booking your wedding on a weekday is significantly cheaper than weekend. One place I looked at was ALMOST half off when doing the wedding on a weekday versus a weekend. It also cuts back on the guest count because not everyone will be available during the week. Also consider just inviting closest family and a few friends to the ceremony and then you can invite more to the reception. Consider dollar store decor like in doilies, fake flowers, mirrors, glasses, colored stones etc. you can find many things there that you would at the party store. Also maybe see what thrift shops have. I always find some pretty cool things there like an old suitcase for $10. Don’t write off traditional venues without looking at the big picture. I found a gorgous hotel that waived the rental fee for a food and beverage min. The non tradtional venues that I looked at once I figured in rental fees, catering, bar services, table and chair rentals, decor, and the security officers that they required me to hire I had way surpassed the food and berverage min at the traditional venue that already had the over all look that we wanted. Plus without the added stress of trying to cordinate all the outside vendors.